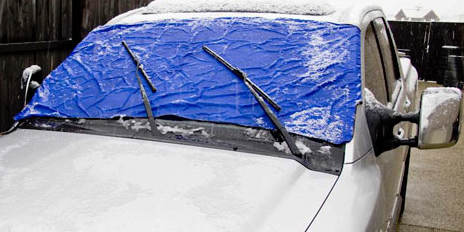 With more months of wintry weather ahead for much of the country, there’s still time to get some tarps and say goodbye to having to get up early in the morning to scrape ice off the windshield of your car. If that sounds good to you, see how easy it is to create a simple frost guard cover with nothing but an inexpensive tarp. 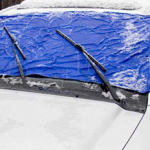 Benefits of Using a Tarp Windshield Cover:Not having to stand outside in the freezing cold scraping your windshield is probably all the argument you need, but that’s not the only advantage. You’ll also save money because you won’t be running your engine all those extra minutes while you’re trying to get your defroster to warm up. Most important of all, you and your family will be safer on the road because your windshield will be clear of ice, and you won’t have to risk driving dangerously with a smaller window of visibility. You can also use your tarp in the summer to block out the sun, and keep your car cool. How to Make a Tarp Windshield Cover:Covering your windshield can be as simple as just spreading your tarp across the glass, and securing it in place with bungee cords. If you want to spend a little more time, you could even sew or glue in some magnets instead if you’re concerned that the bungee cords might scratch the surface of your car. There are products on the market that will do about the same job, but most of them cost significantly more than a simple tarp. Plus, you can easily adjust a tarp to any size you need for your car or SUV. At canopiesandtarps.com, you’ll find a wide range of canvas and vinyl tarps for all kinds of seasonal and year-round uses.Contact usto experience our comprehensive selection, friendly service, and great values. This entry was posted in Tarps and tagged tarps on February 11, 2019 by Canopies Tarps.